You have just been appointed for the job of finance executive of a company that is involved in the hypermarket industry, Tisku. 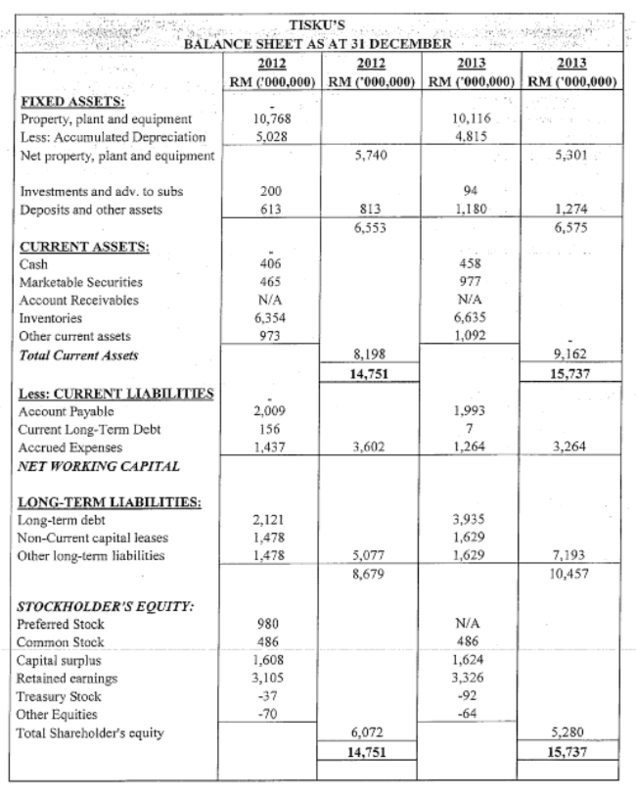 Using the Tisku’s financial income and balance sheet provided here, you are required to analyze the financial performance and financial position using ration analysis. 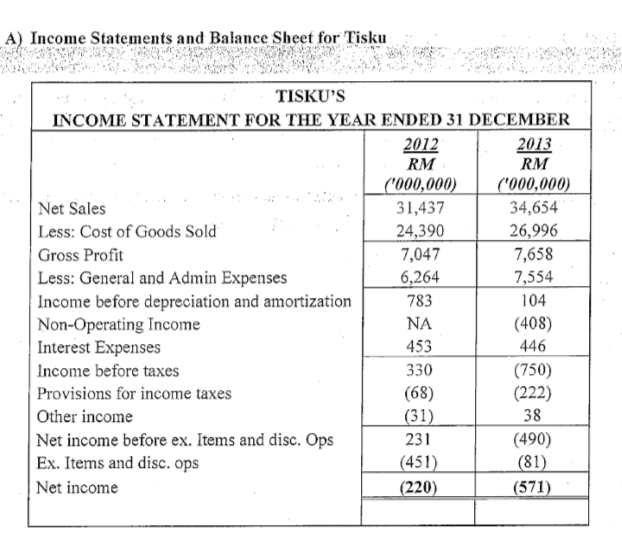 Based on the information given in the income statement and balance sheet, calculate the following ratio for both years 2012 and 2013 and compare them to access the financial performance of Tisku. As the finance executive, propose the TEN axioms if finance to your management that would affect their decision, in the relation and examples of hypermarket industry. In mathematics, ration is a relationship between the numbers of the same kind. A financial ratio (or accounting ratio) is a relative magnitude of two selected numerical values taken from an enterprise’s financial statements. There are many standards of ration used to try to evaluate the overall financial condition of an corporation or other organization. Financial ratio may be used by mangers within a firm, potential shareholders (owner) of a firm and by a firm’s creditors. Financial ratio is also used to compare the strength and weakness in various companies. Values used in calculating financial ratio are taken from the balance sheet and income statement. The statements data is based on the accounting method and accounting standards used by the organization. This is the most common ratio of current assets to current liabilities. This ratio indicates a company’s ability to pay its short term bills. Two common efficiency ratios are inventory turnover and receivable turnover. A high account receivable turnover means that the company is successful in collecting its outstanding credit balance. Market ratios are used to understand how other investors value money. The current market price of a share of common stock versus an indicator of the company’s ability to generate profits or assets held by the company’s is evaluated. Finance is the middle ground between the theoretical economics and the accounting world of numbers. Finance is applied economics. Financial implications are at the heart of every business transaction and decisions. Finance is also a valuable tool used to communicate, judge and monitor the result of business decisions. Axioms are the principle universally accepted within a practice or subject area on the basis of its self evident truth or intrinsic merit. The ten axioms used in financial management is the foundation of financial decision making. There are ten important axioms and almost all the industries do uses this uses it in making decision making in finance. How does the ten axioms of finance would affect decision in hypermarket industry? Additional risks will not be taken unless an additional return is expected. At some point, people will have some saved money. What will they do to it? The answer is simple, to expand future consumption activities. Savings are invested to earn more return. Investment alternative have different amount of risk and expected returns. Investors choose to put money in risky investments because investment offer higher expected returns because the more risky an investment, the higher will be its returns. This is a relationship between risk and unexpected returns. In hypermarket industry, for example a new hypermarket is opened, the investors have to invest a lot of money as hypermarket is an expensive retail facility selling a wide range of products under one roof. Thus hypermarket industry needs a lot of money. Investors do not know whether the hypermarket will go popular among the people as it’s newly open. This is creates a higher risk to them. As hypermarket such as Tesco, Giant and EON is a big industry and not a small business, a big amount of money should be invested. This creates a very big risk which don’t have guarantee in return. A dollar worth today worth more than dollar tomorrow. This is a fundamental concept in finance the money has a time value associated with it. A dollar received today worth more than a dollar received a year from now. Because we can earn interest on money received today, it is better to receive money earlier rather than later. If the benefits overweigh the cost the project creates wealth and it should be accepted. If the cost overweighs the benefit, it should be rejected. In hypermarket industry, when they investors invest money and get profit, they should wisely use the profit get from the business. For example, when get an amount of money after the sales of product, the money should be reinvested to get more profit such as bringing in more product inside the hypermarket. In measuring wealth, or value, cash flow will be used. Cash flow is received by firms and can be reinvested. A firm’s cash flow and accounting profit may not occur together. For example, capital expenses, such as purchase of new equipment or building are depreciated over several years, with the annual depreciation subtracted from profit. However, the cash flow associated with this expense generally occurs immediately. Therefore cash flow involving paying money out and cash flows that can be reinvested reflect the timing for the benefit of cost. In hypermarket industry, the cash received by the investors will be reinvested into the industry to make the hypermarket bigger and wider. The money that they get can be used for example to pay the dividends to the shop in the hypermarket. Besides, cash can also be used to double the products and sales in the hypermarket. The incremental cash flow is the difference between the cash flow if the project is taken on versus what they will be if it is not taken on. Not all cash flow is incremental. The difference between revenues generated by introducing the new product maintaining the original series are the incremental cash flow. The difference reflects true impacts of decision. Guiding rule in deciding whether a cash flow is incremental is to look at the company with and without new product. In hypermarket industry, people should know the difference when there is a new product and their new product and the cash flow in their hypermarket whether it brings profits or not. Thus choosing a new product should be done wisely. Why is it hard to find exceptionally profitable projects? This question tells how competitive market operates and where to look for profitable projects. In competitive markets, extremely large profit cannot exist for so long. How can we find new projects that return more than the required rate of return? Although competitions make them difficult to find, investment should be invested in markets which is not perfectly competitive. Two ways to making less making competitive is to differentiate the products in some key ways to achieve a cost advantage over competitors. Thus, in hypermarket industry, the products being introduced or sold should be differ than the other hypermarkets. Variety kind of product which is hard to find in other hypermarkets can be sold. Besides, different types of services and advertising methods can be used. Cleanliness of the hypermarket should be considered such as toilets. Free parking and can be given to the members of the hypermarket to attract more customers. Goals of financial manger are to maximize the shareholder wealth. The markets are quick and prices are right. Information is incorporated into security prices at the speed of light. Assuming the information is correct, and then stock price will reflect all publicly available information regarding the value of the firm. In hypermarket industry, business should be done without wasting resources as they use capital that is invested by the shareholders to buy resources. When selling items, they have to have a target on the selling of a product such as age group, gender, trend and so on. Besides, selling of a product should be according demand, popularity, seasons and festivals to avoid wastage. The four resources which are land, labor, capital and entrepreneurship should be used wisely as it is very limited nowadays. All the resources should be well organized. The agency problem results from separation of management and ownership of the firm. Managers are not typically owners of the firms. Managers may make decisions that are in their best interest and not in the line with the long term best interest of the owners. For example, cutting research and development cost on new products to maximize current income and pay for performance. They also may approach less energetically and attempt benefits themselves in terms of salary and perquisites at the expense of the share holders. This produces conflict between two parties. Thus, in the hypermarket industry, managers might bring in a new product in the hypermarket to increase their income without asking any permission from the owner. This might increase the risk to the owner and might bring conflict between them. Besides, there will also be communication barrier because of the foreign workers. Any decision taken by financial manager will go impact on taxes. When a new project is evaluated, income taxes play a significant role. Because cash is king, after cash flow of an investment should be considered. The tax consequences of a business decision will impact (reduce) cash flow. Companies are given tax incentives by government to influence their decision. Besides, governments use this fact to shape the decision of a business for. In hypermarket industry, for example, investment tax credit reduces taxes. One of the best example is plastics will not be given and customers will be charged RM 0.20 for the plastics. This will reduce the pollution and it might tax them on the basis on pollution output. Some risks can be diversified away and some cannot. Don’t put all eggs in one basket. Diversification allows good and bad events or observations to cancel each other out preferably reducing total variability without affecting expected return. Process of diversification can reduce risk and as result measuring a profit or an asset’s risk is very difficult. In hypermarket industry, investors can split money and invest in many hypermarkets. This will increase diversification and reduce risks. Resources such as land, labor, capital and entrepreneurship should be divided and cash should be equally spent as it can reduce overall risk. Needs and wants of customers are unlimited, so there should have no more or less stock. Stock should be balanced to reduce wastage. Estimation on the average should be done as early preparation. Ethical behaviors means is doing the right thing. A difficulty arises however in attempting in define doing the right thing, because each of us have own set of value which forms personal judgments about what is the right thing to do. This will create issues and disagreements in firms. Unethical dilemma eliminates trust and loss in public confidence. Shareholders values suffer and take a long time to recover. Firms have to responsible more than just on owners. In hypermarket industry, to avoid any dilemma all stakeholders should be considered when taking decisions. Some ethical dilemma might happen between the workers itself as each other can’t tolerate or do have some misunderstandings. Products sold in hypermarkets should be guaranteed with the expire date and also quality. Products that are being used should be safe. Ingredients should be checked before a product is being sold in a hypermarket. For products which is used by Muslims, ‘ Halal’ logo should be ensured. Besides, when customers were promised with promotional such as free gifts, discounts and so on it should be fulfilled without disappointments to make sure the hypermarket do not lose trust. It is very hard to catch back the trust when next promotion is done. Axioms are much statement of common senses as they are the theoretical statements. These axioms of financial management provide logic behind what is to follow. It helps to build on them and attempt to draw out their implications on decision making. In the world of hypermarkets industry, the ten axioms helps to reduce risk on the business and increase the profit and also helps in making a wise decision in financial management. Bibliography:TheFreeDictionary.com, (2014).axiom. [online] Available at: http://www.thefreedictionary.com/axiom [Accessed 22 Jul. 2014]. Bibliography:Managementparadise.com, (2014).Ten Axioms of Financial Management. [online] Available at: http://www.managementparadise.com/forums/financial-management-fm/200960-ten-axioms-financial-management.html [Accessed 22 Jul. 2014]. Bibliography:Mathsisfun.com, (2014).Ratios. [online] Available at: http://www.mathsisfun.com/numbers/ratio.html [Accessed 22 Jul. 2014]. Bibliography:Investopedia, (2009).Uses and Limitations of Financial Ratios – CFA Level 1 | Investopedia. [online] Available at: http://www.investopedia.com/exam-guide/cfa-level-1/financial-ratios/uses-limitations-ratios.asp [Accessed 22 Jul. 2014]. Bibliography:List4everything.com, (2014).Uses of Ratio Analysis | List4Everything. [online] Available at: http://www.list4everything.com/uses-of-ratio-analysis.html [Accessed 22 Jul. 2014]. "Analysis of Financial Performance." UKEssays.com. 11 2018. All Answers Ltd. 04 2019 <https://www.ukessays.com/essays/economics/analysis-financial-performance-5287.php?vref=1>. "Analysis of Financial Performance." All Answers Ltd. ukessays.com, November 2018. Web. 20 April 2019. <https://www.ukessays.com/essays/economics/analysis-financial-performance-5287.php?vref=1>. UKEssays. November 2018. Analysis of Financial Performance. [online]. Available from: https://www.ukessays.com/essays/economics/analysis-financial-performance-5287.php?vref=1 [Accessed 20 April 2019]. UKEssays. Analysis of Financial Performance [Internet]. November 2018. [Accessed 20 April 2019]; Available from: https://www.ukessays.com/essays/economics/analysis-financial-performance-5287.php?vref=1.